Restoration work on the 17th century Isopu Tower in Nadur has been completed after three years and the newly restored tower will be inaugurated tonight at 7 p.m. The painstaking project - which came in time to save the dilapidated site - was carried out with the full collaboration of Din l-Art Helwa. The tower was restored to its former glory and finishing touches included plastering and cleaning the exterior. Dr Chris Said told The Sunday Times that the restoration of the coastal tower is part of a bigger project that Nadur council wants to finalise in the area stretching from Dahlet Qorrot to San Blas Bay. This includes the rehabilitation of the hard stone quarry, the first phase of which was concluded recently as the quarry was filled with inert waste. The council is now seeing to the second and last stage that will comprise the first afforestation project in Gozo, including a picnic area and other facilities. The council also welcomed the MEPA decision to declare the garigues of Qortin ta' Sopu and Qortin tal-Mangun special areas of conservation and eventually sites of Natura 2000. By next winter, the area, which boasts breathtaking views, will host a trail starting in Dahlet Qorrot, proceeding to Qortin tal-Mangun, Rihan Valley and ending at Sopu Tower, where those following the trail may taste local products. In the meantime, efforts to eliminate the outfall into San Blas bay are underway and should be finalised in the coming months. This will ensure that this bay, which is one of the most beautiful, secluded beaches on the Maltese islands, will be totally clean. These works are being carried out by the Water Services Corporation as part of the sewage master plan for Gozo. 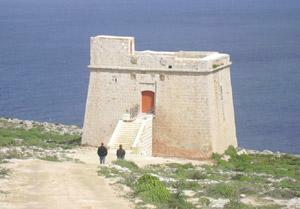 Dr Said said that the council agreed that the Isopu Tower be used for eco-tourism purposes so that tourists and locals will be able to sample products from Nadur on completion of the trail. Participants will also be able to visit the tower for free. The tower is being inaugurated by deputy Prime Minister Tonio Borg, Nadur mayor Chris Said and Din l-Art Helwa president Martin Galea. There will also be a varied programme, including a re-enactment depicting the tower's history. The public is invited to attend and transport from the barracks to the tower and back will be provided.